This may sound silly to technophiles, but plenty of people don’t understand how secure Web sites work. People often ask how they can shop on a Web site, giving out personal information, and feel even remotely safe? After all, you’re sending identifying data, without guide or guard, into the vast expanse of cyberspace. Expecting your data to arrive at the right place at all, let alone safely, seems like putting your faith in a miracle. How does it work? The secret lies in a trusted third party and good encryption. The HyperText Transfer Protocol is an application layer protocol, which means it focuses on how information is presented to the user of the computer but doesn’t care a whit about how data gets from Point A to Point B. It is stateless, which means it doesn’t attempt to remember anything about the previous Web session. This is great because there is less data to send, and that means speed. And HTTP operates on Transmission Control Protocol (TCP) Port 80 by default, meaning your computer must send and receive data through this port to use HTTP. Not just any old port will do. 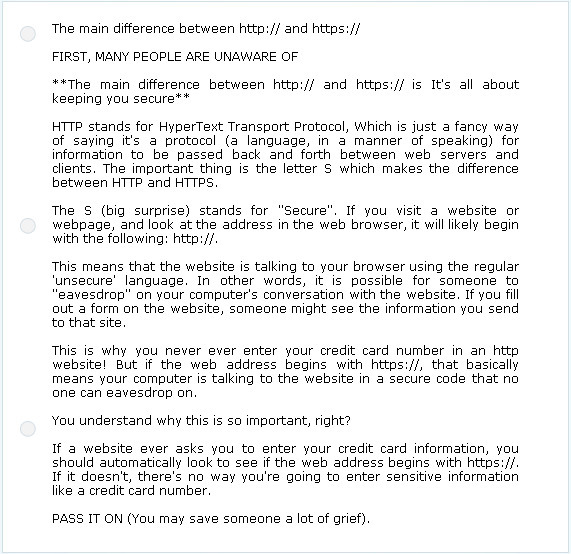 Secure HyperText Transfer Protocol (HTTPS) is for all practical purposes HTTP. The chief distinction is that it uses TCP Port 443 by default, so HTTP and HTTPS are two separate communications. HTTPS works in conjunction with another protocol, Secure Sockets Layer (SSL), to transport data safely. Remember, HTTP and HTTPS don’t care how the data gets to its destination. In contrast, SSL doesn’t care what the data looks like. People often use the terms HTTPS and SSL interchangeably, but this isn’t accurate. HTTPS is secure because it uses SSL to move data. With HTTP, you sit at your browser and interact with data. HTTP’s job is to present that data to you, and browsers are the means of doing so. Mozilla’s Firefox browser, for example, understands HTTP instructions and arranges the data as the site’s designer intended. The browser knows what to do when you click. It uses HTTP to do this. But HTTP cannot do much beyond that. How the data travels from Point A to Point B, or even if it travels at all, is none of HTTP’s concern. This is a great compromise if you want speed and elegance and couldn’t care less about security. One does not require security to view BizTech’s latest online articles, for instance. With HTTPS, the story is quite the same. But when security is a must, HTTPS differentiates one sender and receiver from another. SSL takes the data, going or coming, and encrypts it. This means that SSL uses a mathematical algorithm to hide the true meaning of the data. The hope is that this algorithm is so complex it is either impossible or prohibitively difficult to crack. The encryption begins when the owner of the Web site purchases a time-sensitive certificate from a trusted certificate authority such as VeriSign. You can get a certificate anywhere, or even make your own, but is it trusted? Your browser will let you know. This certificate is a security code created specifically for that one user, or even for that one Web site. The code is so complex that no one else on Earth should have a duplicate. Getting a certificate can be an involved task. All types of information must be recorded so the issuer of the certificate can be a reliable authority on the certificate’s owner. Information that must be provided includes the name of the site and even the name of the server that hosts the site. Complexity makes counterfeiting incredibly difficult. This makes the issuer a trusted third party. When your browser sees the secure Web site, it uses the information in the certificate to verify that the site is what it claims to be. Browsers commonly indicate security by presenting a picture of a shiny closed lock at the bottom of the screen. This process is not always perfect because of human error. Maybe 53.com is a valid banking site, but 53RD.com is not. We call that phishing. Unscrupulous people phish for careless people. So be cautious. After the identity of the Web site is accepted, the encryption is negotiated between the browser and the Web server, and the data is all but locked up tight. Knowing the difference between HTTP and HTTPS can help users buy with confidence and help businesses get started in electronic commerce. S-HTTP is an extension of the HTTP (HyperText Transfer Protocol) that permits the secure exchange of files on the World Wide Web. EIT (Enterprise Integration Technologies) developed S-HTTP in 1999 to provide a secure communication between an HTTP client-server pair. S-HTTP is awaiting approval as a standard from the IETF (Internet Engineering Task Force). An S-HTTP file is encrypted or it contains a digital certificate (an electronic credit card), or both. It provides secure communication between an HTTP client-server pair in order to enable spontaneous commercial transactions. For example, when you purchase something online, and you are asked to provide a credit card number, the URL (uniform resource locator) at the top of the screen should change from http:// to https:// or shttp://. The ‘s’ lets you know a security system is in place. This protocol is an alternative to the SSL (Secure Sockets Layer) security protocol. The difference between the two protocols is that S-HTTP can authenticate a user while SSL authenticates a server. You can use S-HTTP, for example, in situations where the server represents a bank and requires authentication from the user that is more secure than an ID number or word and password. S-HTTP does not use any single encryption system, but it does support the Rivest-Shamir-Adleman public key infrastructure encryption system (an Internet encryption and authentication system). Popular Web servers support both S-HTTP and SSL, as do newer browsers. So basically what it is Secure Hypertext Transmission Protocol (SHTTP) is a more advanced version of HTTP, basically using document encryption. HyperText Transmission Protocol Secure/Security (HTTPS) is normal HTTP over SSL, which uses a private key to encrypt the data.